New Delhi: Muslims are the fastest growing group in the religious mosaic of India, according to data released on Tuesday by the Registrar General and Census Commissioner that experts said reflected a global trend and low infant mortality rates. 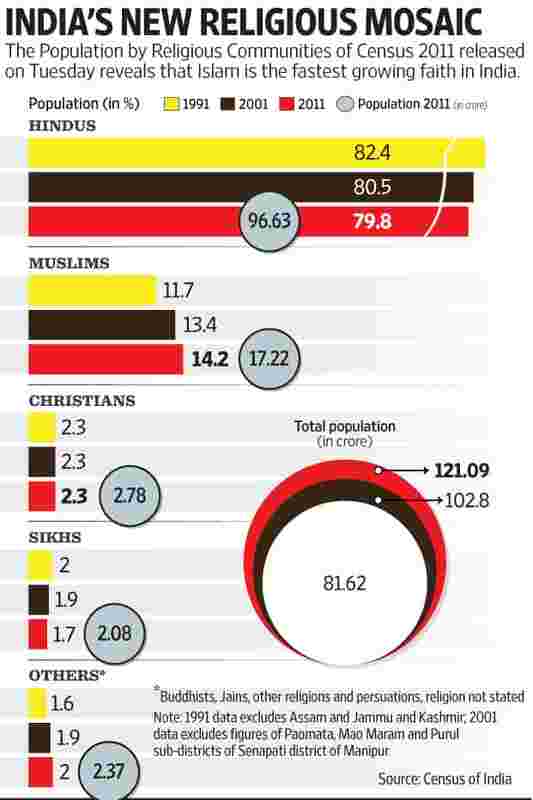 The data, which could potentially revive a fractious debate on religion, reveals that the proportion of Hindus, Sikhs and Buddhists in the total population shrank in the decade to 2011, while there was negligible change for Christians and Jains. “The proportion of Hindu population to total population in 2011 has declined by 0.7 percentage points (PP); the proportion of Sikh population has declined by 0.2 PP and the Buddhist population has declined by 0.1 PP during the decade 2001-2011. The proportion of Muslim population to total population has increased by 0.8 PP. There has been no significant change in the proportion of Christians and Jains," said a press statement by the ministry of home affairs (MHA). The data shows that while the general population grew at the rate of 17.7% between 2001 and 2011, the growth rate was 16.8% for Hindus, 24.6% for Muslims, 15.5% for Christians, 8.4% for Sikhs, 6.1% for Buddhists, and 5.4% for Jains. Experts said the figures reflected a global trend—not something unique to India. “Even the recent Pew Research Center study showed Islam is the fastest growing religion (in the world). Muslim infant mortality is lower than other religions—this effect can be seen in the number of births per woman, which means Muslims have a higher total fertility rate than that for Hindus and Christians," said Javid Jamil, a medical doctor and scholar of religions. According to The Future of World Religions: Population Growth Projections, 2010-2050, a research study conducted by Pew, between 2010 and 2050, the population of Muslims is expected to increase 73%, to 2.8 billion, resulting in an increase in their proportion in world population from 23.2% to 29.7%. The study highlighted two contributory factors—the lower median age of Muslims (23 in 2010 as compared with 30 for non-Muslims), and the higher number of children a typical Muslim woman bears (3.1 as compared with 2.3 for non-Muslims). Still, “there is not only an overall decline in population growth but also a sharp decline in the growth rates of both Hindus and Muslims", Jamil added. Indeed, between 1991 and 2001, the Muslim population grew 29.3%, indicating that the 24.6% growth seen between 2001 and 2011 marks a slowing. According to the National Family Health Survey-3, Muslim fertility is decreasing faster than Hindu fertility, which means a narrowing of Hindu-Muslim fertility differentials. The census data, which was compiled in 2011, says India is home to 966.3 million Hindus, who make up 79.8% of the population. There are 172.2 million Muslims (14.2% of the population); 27.8 million Christians (2.3%) and 20.8 million Sikhs (1.7%). The data also shows there are 8.4 million Buddhists with a 0.7% share of the population and 4.5 million Jains, making up 0.4% of the population. Previous surveys may have also been a little inaccurate, said one expert. “We cannot ignore (the fact) that the census did not cover Assam in 1981 and Jammu and Kashmir in 1991. So, in such cases, a proxy variable was taken into account. So the numbers were approximate," said Mohd. Shahid, a professor in the department of social work at the Maulana Azad National Urdu University, Hyderabad. All states were covered by the 2001 survey. Some key states where the proportion of Muslims increased during the decade are: Assam which saw an increase from 30.92% in 2001 to 34.22% in 2011, West Bengal (from 25.25% in 2001 to 27.01% in 2011) and Kerala (24.70% in 2001 to 26.56% in 2011). In India’s most populous and politically crucial state, Uttar Pradesh, the proportion of Hindus fell from 80.61% of the population in 2001 to 79.73% in 2011, whereas the proportion of Muslims increased from 18.50% in 2001 to 19.26% in 2011. Some experts are worried about the implications of the data release. “The political dimensions are that it could be misused to stir up communal tension. There is data to prove there is equal incidence of poverty among Hindus and Muslims, so the drop in the rate that we see for the majority community can be attributed to urbanization, mobility and higher income group families. These factors contribute towards smaller families, which we eventually see reflected (in the data)," said professor Balveer Arora, former rector and pro vice-chancellor of Jawaharlal Nehru University. The data has been released ahead of the Bihar assembly polls that are likely to be announced next month. The proportion of Hindus in the state has seen a marginal decrease from 83.23% in 2001 to 82.69% in 2011, whereas that of Muslims has seen a marginal increase from 16.53% to 16.87% in 2011. Ashwaq Masoodi and Nikita Doval contributed to this story.